The perfect off-duty style, isn't it? I'm always happy to see your post and those who have this subjects are one of my favourites! I like your choices, that's for sure! Every piece of this outfit and the entire look! I realise now that I miss a simple look like this, simple, comfy and chic! ora che mi ci fai pensare è da un po' che non indosso i miei boyfriends! Hi Lilli, casual is always my favourite. 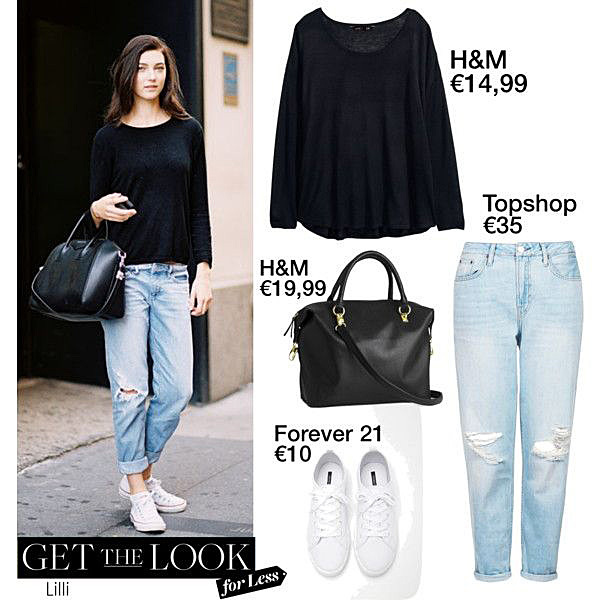 Black and denim is just perfect and toned down with white sneakers. So stylish chic. Happy Friday! Sai Che un paio Di bfjens mi manca.. I never heard about this model but she is very pretty. Her sport outfit is very relaxed, what I like. Your selection of alternative is fantastic. We don't need much money for looking stylish. The H+M bag is great. I think I must go to a store and take a look. ciao Lilli! un look essenziale, comodo e semplice! mi piace da indossare tutti i giorni! mi piacciono moltissimo la borsa H&M e i jeans che hai selezionato! adoro questa rubrica, sei bravissima! This totally looks like the type of outfit I wear on the weekends and of course you nailed it with your look for less version Lilli! That bag you chose it really chic and the price is right too :) Have a lovely weekend my dear! Ottima proposta, molto belli i jeans! Ma quanto sei brava con questa rubrica. You find the perfect affordable alternatives! Love this comfy and casual look. Have a great weekend. I agree, it's the perfect off duty style indeed. I actually destressed one of my old white jeans and now I finally have the perfect boyfriend jeans for myself. Great look, Lilli and definitely one that I can try to recreate. Mi piace molto! Un bacio Lilli. Adoro questo genere di look easy! Something like this is my type of everyday uniform... I just love bf/loose jeans and black oversized sweater is just something that every girl needs in her closet :) Great job, my dear friend! Lilli, that is the perfect match! Love it! Stylish and comfortable. Adoro questo genere di look Lilli, semplice ma assolutamente d'effetto! !